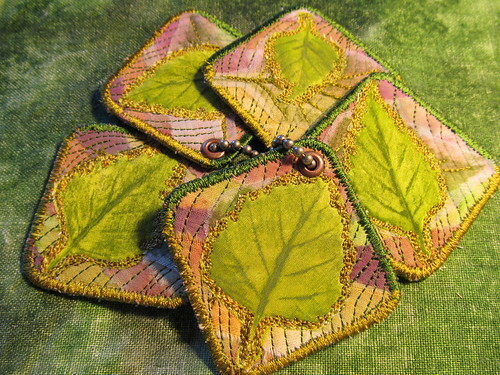 I now have another entry to the Ten Leaves series – this is ten birch leaves. Each card has a second, ghost leaf in silk organza underneath the printed silk leaf. I think the proportions are not wonderful, and I may make a another using smaller leaves, or larger cards. I really like the key chain holding them together. My process is lumpy at best. I work hard at not overthinking things, so I tend to rely on injecting randomness into backgrounds and working the foreground pieces as aggressively as I can. One of the reasons I treasure variegated thread is the lack of control I have over color. I can place it as precisely as I want, but the color is whatever comes off the spool next (particularly with the more expensive and/or hand dyed threads) and I have to make it work. Which feels good for me, in the same way stretching does. These birch leaves are a good example. I had a couple leaves the right size, but I wanted to show them differently than just printing pictures of them onto fabric. Instead I used a paintstick (oil paint in a stick form; not exactly oil pastels, nor yet oil paint in tubes) to rub paint onto the leaves, and then ironed the fabric over it, resultng in something partway between a crayon rubbing and a print. I tried a couple other techniques but settled on this one when the alternatives were less than satisfacatory. Timna has a lovely description of her process, along with illustrations, on her blog.